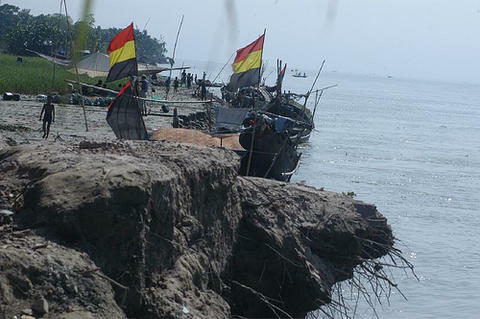 There is a series of articles on BBC's website, bbc.com, that describes a journey through Bangladesh to ascertain the effects of changing climatic patterns. In one photo, there are two unknown flags. I have uploaded this photo to the Photos section of the group. Any ideas as to what this is? Considering the general settings, it would seem as if the 'flags' are actually three flags each - monocolored banners are a major feature of devotional imagery in the Subcontinent, especially but not limited to Buddhists. While I can say they are almost certainly likely to be some kind of prayer banners, whether they're permanent or temporary (in response to a recent event or crisis) and which group (ethnic or religious) is using them is beyond me. My eccentric mother of 80 years sent me a flag in the mail (for what reason, I can only guess Christmas), and she does not know what the flag represents. It is horizontal striped, tri-colored, much like Bolivia, but has the colors in this order: Yellow-Orange-Green, or Green-Orange-yellow. I have looked at every flag picture I can find on the FOTW website and am out of leads. It is too orange to be red, and is a well made 3x5 [feet], nylon, maybe as early as the 70's i would guess. There is no maker marks, just a "3x5" stamped on the white binding with brass grommets. She probably picked it up at a yard sale or thrift store, and there is no telling why she found it interesting enough to buy. She lives in Central Minnesota, and I don't think it is a college flag, but one never knows, maybe a high school or car dealership thing, but the colors don't make sense for high school. Someone was told that the flag on the right is a Christian flag. Can anyone tell me from what sect, group or church it derives? The wheel of life used by Indian tribes in the USA is identical to the Celtic cross used by right wing groups, given the white on red I would say this usage is native American, however, the photo is not perfect if the cross sections are not equal, then I would say this might be a one-time-type religious flag from some small Christian sect. Perhaps more of a disturbing choice than a poor one. Without implying anything about churches in general, it is safe to say that there are some churches which themselves could well be described as extremist and racially oriented. But in any case, I don't yet see much reason to conclude that this in fact any church flag. That is based on a single second-hand (or maybe third-hand) report of unknown reliability. 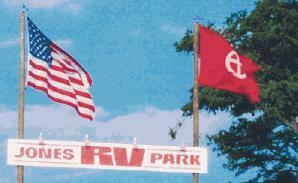 On a lark I found Jones RV Park, complete with a cropped image of the same main gate, so no flags. I called the number listed and was informed that the flag was put up and flown by the late owner's wife in honor of her husband. I asked about the symbolism of the flag and was told it was "A Christian Thing;" but that if I wanted more information I could call back when she was there. For those who wish to pursue this here is a lead. I see that Jones RV Park has been contacted. I've never been able to do so over the net. I take it the suggested follow-up was never taken. Looking at this again, I wonder whether the charge actually is a sun symbol, or whether it's a letter C with a cross in it. In a report on the state of the Portuguese armed forces there is a photograph with M113 APCs, showing a flag in the background that looks a bit strange to me. It is a vertical, hanging flag, swallow-tailed, in the upper part blue, below divided of red and green. I can just guess that this refers to the national colours, but I can't explain the blue. Source: Jane's Defence Weekly 1987: vol. 8, iss. 11, pp. 621-629. Well, I've never seen anything even remotely similar to that, but usually these vertical banners, in Portugal, are more decorations than anything else. I wouldn't be surprised if this was the case, and I wouldn't be surprised if the blue was meant to refer to the European flag. Difficult without context. Does anyone have access to the relevant issue to see what's supposed to be in the photograph? Is it my imagination, or is there a thin white line emblem on the blue canton? Maybe just reflection? The flag seems to be made of very thin material, doesn't it, so it is hard to tell? Can anybody make out what the pole is mounted on? It appears to be leaning outward, as from a banister on a railing. My guess was that it's just the reversed print from the other side, which also shows in the rest of the image. I flipped the image, but there's not enough to make it readable. The pole looks to me like it's just a dirt-mounted pole. But this is why I was asking for more context. I don't even know what continent we're on. As far as I know, this might be the equivalent of a wind sock, somewhere. After all, the pole doesn't look like straight kind we'd hoist a representative flag on, and the flag isn't hoisted with a taut line.